Simply Crochet is a monthly craft magazine from the makers of Simply Knitting and Mollie Makes. This title is a celebration of all things crochet and is full of creative ideas for anyone who loves - or would love to learn - crochet. 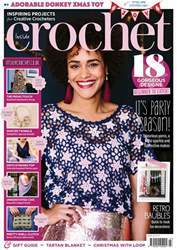 Featuring over 20 crochet patterns every month, technical advice, clear instructions and crochet inspirations, plus a FREE gift with every issue - you'll be hooked on handmade from the very first page!